Ashtanga Vinyasa Yoga is a systematic approach to yoga, originally designed for the householder. In this system you could combine the traditional practices of yoga that would normally require full time dedication, and condense them into a practice lasting just a couple of hours. This would allow time to continue with work, whilst getting the benefits of the practices, and experiencing (first hand) the philosophical concepts. The principles of this style of yoga are based on the classical text ‘The Yoga Sutras by Patanjali’. Patanjali’s Yoga Sutras were the first written, scientific presentation of yoga (around 5000 years ago). He compiled all available knowledge about the development of the consciousness and structured it in such a way, that is could be separated from any particular religious teachings or doctrine. He starts with Atha yog-anushasanam – now the discipline of yoga. Meaning both that the discipline of yoga may only be practiced NOW, (not tomorrow, yesterday or five minutes ago) and that now (from here in) will be described the discipline that is yoga. Second is Yogas Chitta-vritti-nirodhaha – yoga is becoming detached from the vibrations of consciousness. Later on in the sutras, Patanjali describes the “Eight Limbed Path”, or “Ashtanga Yoga” (Ashta – eight, Anga- limbs), which like the limbs of the body, make up the whole by working together in various ways. The first three ‘limbs’ refer to the outer aspects of yoga, they lay the foundation for deeper practice, and will bring the body to a state of balance and physical health. 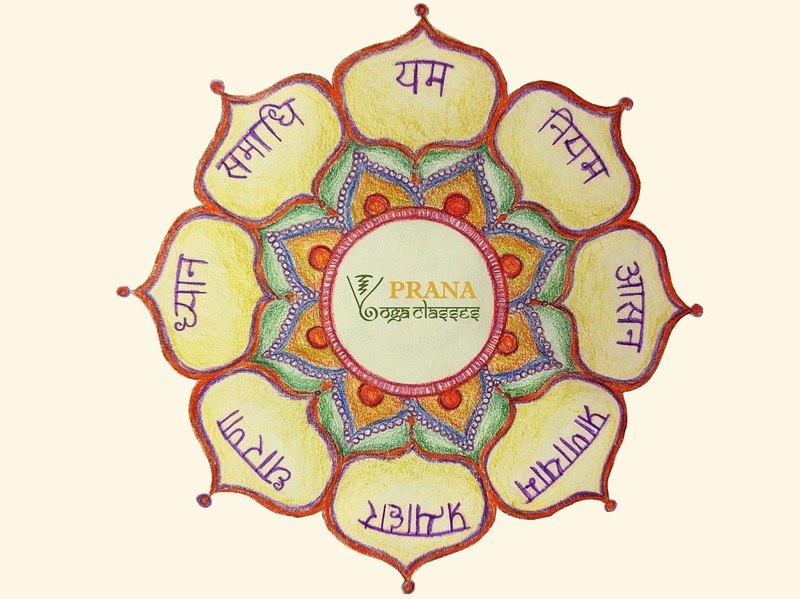 Pranayama and pratyahara (fourth and fifth) make the bridge between the inner and outer, and the last three ‘limbs’ (sometimes referred to as samyama or integration) naturally go together as the inner or higher aspects of yoga. Concentration leads to meditation which leads to absorption. These three are what bring the knowledge of the true self. Right social ethics, play a major role in physical health, psychological well being, and spiritual development. Following these base rules means we will reduce harmful impact on the world and not become entangled in external complications of destructive relationships, or ‘wrong’ possessions. This is non violence on a physical level and on a mental level. Not causing any intentional harm to others or yourself, this includes the continued practice of non-aggressive thoughts towards yourself or others. HOW TO APPLY: Non violence to your body by not pushing too hard. Yoga must be the balance between ‘himsa’ violence and ‘halasya’ laziness. Know your limits. Ambition can also become a type of violence. Honesty, firstly to yourself, then to others. Consider what you are implying, as well as what you are actually saying. You are often more exposed than you let yourself believe, when your actions do not match your words you invite other people to lie to you. Be true to your intentions, why are you doing the practice? Who is the person who makes a resolution and who is the person who breaks it? HOW TO APPLY: Be true to your intentions, and honest about where you are. If you are constantly switching between past and future you are avoiding the ultimate truth which is being present. Avoid thinking or day dreaming by using drishti, and ujjayi pranayama to focus. This applies to both objects or material things, and ideas, or personality traits. Using manipulation and power to gain status devalues you. Show what you have to offer, think about what you can bring not what you can take. HOW TO APPLY: It is possible to steal subtly, e.g. Stealing someone’s confidence, making them feel insecure, or stealing their energy. But also stealing in terms of style and movement. Yoga practice is the time to focus only on yourself and your self development. Brahmacharya or non-lust. Brahmacharya means walking towards the divine Brahma, to move toward the essential truth or to achieve self-control, abstinence or moderation and it is used especially regarding to sexual activity. It is about not giving in to our ego’s excessive desires, taking nothing in excess. HOW TO APPLY: Don’t lose your energy downwards. Using mula bandha (root lock) prevents energy from flowing down and out. Avoid projecting sexual thoughts onto other students or teachers, particularly during adjustment. Greed, sensual indulgence, and accumulation of possessions are common in today’s society. Teach yourself to take only what is necessary, and reduce attachment to the idea of owning things. Focus your desire to your inward study. HOW TO APPLY: Craving attention and approval from the teacher or other students will bring you further away from your purpose and bring more distractions in the mind. These are the lifestyle principles thought necessary to support basic health and well-being, they are what will allow you to develop your yogic practice. Inner cleanliness achieved by Kriyas (yogic cleansing techniques), pranayama and asanas. Outer cleanliness keep a clean environment or surroundings. Mental cleanliness by proper impressions, if your mind is somewhere you must reside, decorate it with beautiful poetry, music, artwork, and other inputs. Bahya Saucha – External cleanliness- this includes pee, poo, shower, before practice. Antara Saucha – Internal cleanliness, happens with practice. When you sweat let it stay on the skin so that the body can reabsorb the lost minerals while leaving the ama (toxins) to be showered off afterwards. The practice of humility, modesty and finding contentment with what you have and who you are. HOW TO APPLY: Realise your own ability, and level. Yoga is not a competition, and how your asana looks does not determine how good of a person you are. Be content with the path that you are on, enjoy the journey and stop thinking about the destination. Impose rules upon the self, to create an inner conflict. (decide wake up at 5.00 am and feel the resistance) the conflict sparks the desire for right knowledge through discipline, setting intentions and sticking to them. HOW TO APPLY: Make a commitment to yourself and to the practice. By keeping the practice regular over a long period of time you increase your self worth, without increasing ego. If however you only practice asana, the ego may become stronger and the truth, harder to see. Meditating on the self by reflecting with clarity, and without judgement. As your knowledge about yourself grows deeper, so does your connection to your surroundings. Know yourself and love yourself. HOW TO APPLY: Observe and become aware of the mind and the body during practice, then you can realise that you are not the mind or the body, and you will become aware of the observer. Regardless of your personal beliefs, surrender is a powerful mind tool which is key to dropping the ego and mental illusion. By bringing devotion to your practice, will give new levels of understanding and clarity. To what or who you surrender to is not important, most important to surrender to faith. HOW TO APPLY: Start and finish your practice with devoted mantras. During the practice realise each movement is only possible because of the circumstances in which you find yourself, surrender to the idea that you are not creating the movement (therefore needing approval or scolding) but that the universe is moving through you. This is the joy to be found. Until you are physically healthy it is very difficult to focus on the higher practices of yoga. The purpose of asana is to bring balance and steadiness in the body that can be used in higher practices. This means removing physical blockages to allow you to sit comfortably for meditation. Building the discipline, and strength in the body required for strong mental practice. Bringing balance to the body to remove toxins and restore physical health. Many people get ‘stuck’ on the level of asana for the feel good qualities of strength, flexibility, balance, but this is really just one tool which will help to bring you closer to the truth and clarity. When proficiency is achieved in the primary series of Ashtanga Vinyasa Yoga (Yoga Chikitsa) the body will be brought to a base level of good health. The internal organs will be cleaned, and all major blockages will be removed. When proficiency is achieved in the secondary series of Ashtanga Vinyasa Yoga (Nadi Shodhana) all energy channels in the body will become unblocked, allowing free movement of prana. The advanced series’ of Ashtanga Vinyasa Yoga bring deep focus and mental and physical strength. HOW TO APPLY: Asana involves both the external physical aspect and the internal energetic, spiritual and mental aspect. Bring focus on the internal aspect of each asana as well as the external. Try to find a internal balance in every posture. Pranayama is the bridge between the body and the mind. While the action is physical, the effects make the mind calm, lucid and steady. There are many different techniques, but you become accomplished in pranayama by becoming aware of the gaps between breaths. Learning to watch the gaps between breaths, will teach the minds how to watch the gaps between thoughts. HOW TO APPLY: Bring mental steadiness by focusing on the sound and flow of the ujjayi pranayama throughout the practice. Use energy more efficiently by directing the prana internally by using bandhas(locks). After the nadis have become clear (second series – nadi shodhana) you will feel more effect of the pranayama. Withdrawing the senses is the link between the outer and the inner worlds. It is common for people to become ‘slaves to their senses’. The consumer idea, that wealth is the ability to indulge in sensory pleasures, is not shared by yoga. Yoga teaches you to be able to use your senses as tools, as and when you need them but not to be completely distracted by them. It is not the suppression of the senses but their right application, which includes the ability to put them to rest. HOW TO APPLY: The sound of the strong steady Ujjayi breath will focus the ears, and the effort will focus the mind. Pratyahara is working on drawing in the most superficial part of the mind, which prepares us for working on the deeper levels of the mind. Using drishti (gaze points) prevents the eyes from wandering and becoming distracted by your surroundings. Keeping your body and your space clean prevents youu from being distracted by smell. Control of the mind, which is right attention. It is the capacity to give all your mental power, at will, to whatever you need to examine. Dharana involves developing and extending the power of our attention. Any technique we use cannot be called meditation, but we use the techniques as tools to train the mind to fall into the state of meditation. Much like counting sheep, or reading books, are techniques to help you fall asleep but they are not sleep in themselves. HOW TO APPLY: Drishti (gaze points) is also a concentration technique. We also use the Vinyasa count as a type of mantra (another concentration technique) which is why this part of the practice is so important for keeping the attention on every single breath and movement, mentally attaching them to the numbers. Dhyana is the capacity to sustain your attention without distraction. It enables you to mirror reality, and objectively perceive the truth of things. Meditation is this natural state of awareness that we fall into. Any ‘meditation techniques’ are not considered as meditation and really belong to Pratyahara or Dharana. HOW TO APPLY: At the end of the Ashtanga Vinyasa practice there is 25 breaths in Padmasana (Lotus Posture), this is where you fall into meditation and feel the real effects of the practice. For beginners this may not be possible, they should instead try to continue with concentration, focussing the mind on the breath. Samadhi combines the words ‘sama’ meaning even or equal, and ‘dhi’ meaning the intellect, or to see. It is the state of intellectual equilibrium, where you can effectively and efficiently use the mind, but you are no longer attached to the outcome of the thoughts. You stop needing to symbolise and rationalise the things around you, making up stories so that the universe fits into your personal story. You can see things as they are clearly and without bias. This allows you to act efficiently when necessary or not act when not required. The mind becomes a tool to be used by the self rather than the controller and manipulator of your existence. HOW TO APPLY: In terms of our practice, Savikalpa Samadhi (a non permanent state of Samadhi) is reached when we enter into savasana (corpse posture) at the end. Again this will not come for beginners, and is only possible if preceded by proper Dhyana (meditation). This is the time for you to feel the bliss of the practice, and enter into the day with complete clarity. There are different types of Samadhi, describing different states of detachment. Savikalpa Samadhi – where the intellect is being used, but the ego is detached, it is linked to feeling the bliss state. Nirvikalpa Samadhi – is without conceptualisation or form, it has gone beyond any sensations of pleasant and unpleasant. Maha Samadhi- when someone consciously chooses to leave the body in full awareness. The possibility is there for everyone, the question is can you sustain the process?